I'm in the Best Western, Westlock tonight getting ready for tomorrow's workshop with Dr. Avi Friedman. If you're from Grande Prairie you may have heard Dr. Friedman's name when council sponsored a visit from him last term. I liked what I heard back then and since we are working on a Municipal Development Plan (MDP) review right now I wanted to know more. The MDP is the overarching document that guides all the other plans that the city does so it's principles have a big impact in how our community develops. In fact it literally shapes the way our neighbourhoods grow, mature and redevelop - so it has a big impact on our quality of life. I'm hoping that Dr. Friedman's workshop will lead to some positive idea that we can include as we rework our MDP. With so much construction going on in the city over the last few years we've had lots of opportunities to do a little extra and improve the over-all look of our city. In my opinion we haven't always made the best of these opportunities but that's starting to change. Over the next couple of weeks you'll notice a little colour being added to our streets through the use of stamped concrete in some of the road consturction projects that are being finalized. There isn't much of a cost difference to use the colourful concrete and I think it makes a big improvement. There's been a lot of work to match the colour with the brick sidewalks downtown. The idea is that over time the interlocking brick sidewalks could be replaced with stamped concrete which would require a lot less maintenance. For the time being I think it will be a welcome splash of colour that will help improve our streetscapes! You'll see the stamped concrete at 107th Avenue south of the Casino, the new 102 Street connection to 116th ave (pictured above), 100 Avenue & 92nd Street by Cobblestone and 68th Avenue by Countryside South. We at the library were all saddened to hear of the passing of Clem Collins. He was a staunch supporter and friend of the library. Among his many contributions were the Collins Membership Fund -- a fund he established that pays for library memberships for those who can't afford one. As well, Mr. Collins established and funded the annual Clem and Muriel Collins Short Story Writing Contest which celebrated its 20th year this year. He believed strongly in encouraging and supporting a love of writing and this contest was very popular with aspiring writers of all ages. Mr. Collins also contributed funds towards the new library and we are deeply saddened that he will not be with us as we open the new library next Spring. Ghost and goblins, witches and werewolves are invited to a Halloween party with a puppet show, stories, games and Halloween treats. Unparented. Ages 4 - 8. Registration required. Saturday, October 25, 2:00 - 3:00 pm in the Story Room. Win tickets to see Franklin! Tell us what you like best about the Christmas season and be entered to win tickets for 4 to Franklin! Enter in the Children’s Library from October 1 - November 5. Tickets: $24 (adult - 18 and over) & $18 (child - 12 months to 17 years). Tickets are on sale at the Crystal Centre box office. 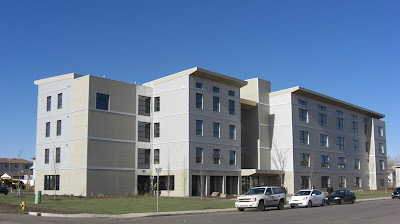 You may have been following the development of Hearthstone Manor, the City's 40 Unit affordable housing complex. My previous posts mentioning Hearthstone can be found here. Today was the building's grand opening and I have to say that I am very proud of it. 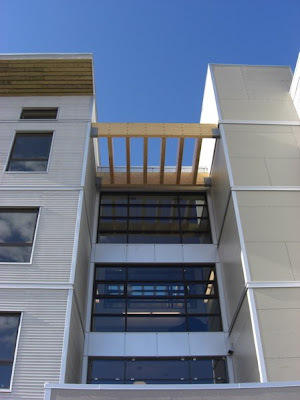 Not only is it addressing the need for quality affordable housing, its also built to a LEED Silver standard, meaning it is very environmentally friendly and over time it will realize significant operational savings over conventional construction. There were of course a few speeches and a ribbon cutting but talking with residents of the building was the real thrill of the day for me. Many people played an important role in realizing this vision, of course not all of them were in attendance today but they can all be proud of what they helped to achieve. A detail view looking up from the main entrance. Even though the construction looks simple it's certainly not boring. 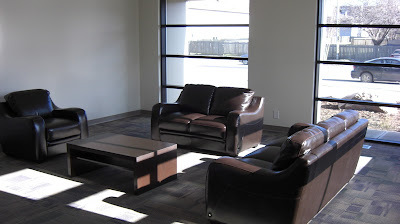 One of the great things about the building are the outstanding common areas. The units are modest in size but the building feels open and comfortable. This is on the first floor. 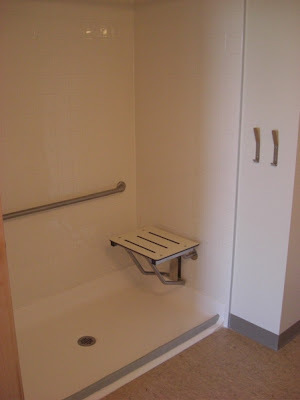 Of the 40 units 9 are fully accessible to those who maybe in wheelchairs. 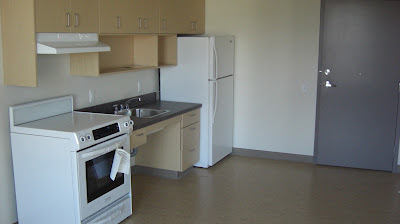 Notice the stove with knobs on the front, the sink that wheelchair can roll under and (if you look closely) the lowered peep-hole in the door. Again in the accessible unit... notice the unique design of the shower that allows a chair to roll in over the little rubber seal at the bottom. 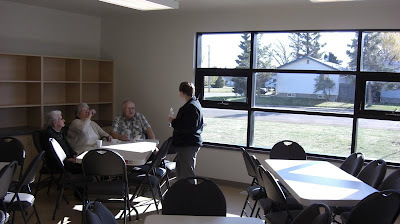 Some residents gather in the multipurpose (MP) room. The MP room is adjacent to a common kitchen and will be available for residents to book for birthday parties or family gatherings. 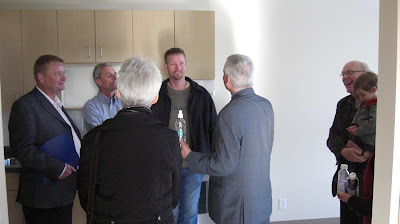 It will also be available as a meeting space for community groups or for on-site courses or programs for residents. From left to right; MLA, Wayne Drysdale, Brian Hillaby from Grande Spirit, Ald. Gustafson & Ald. Radbourne listen as Felix Seiler describes details of the building's construction. ... and here's most of the group back at the grand opening. Last night at the Golden Age Centre the City hosted the first in what will likely be a series of Town Hall meetings. The turn out was good with probably 40 people in attendance. The night was chance for residents to interact with council on a fairly informal basis - everyone was free to ask questions and bring forward concerns or ideas. I was really impressed with the discussion and happy to have an opportunity to hear the range of issues that are on people's minds. I took notes through the evening so I could share a general sense of what people were talking about and it's a pretty wide ranging list. • Concern: 6 Month Shutdown of the Building Materials Recycling Centre? • Suggestion: Seniors "Play Parks"
• Question: Who so Few Bidders on the Multiplex Construction? All in all a good night. I think council and staff will be able to pick up on the concerns to make sure they are addressed and hopefully we'll be able to integrate some of the good ideas into our planning and decision making. What did we get out of that Election? The federal election is over and I feel a little ripped off. One really has to question what value the 5 week, $290 million dollar campaign actually provided to Canadians. After all, we are back in a minority government and we had the lowest voter turn out in history. I have quite a few friends who think that "government doesn't affect my life" so I'm not surprised that turn out is declining. Governments at all levels have to work to re-engage citizens in the process. 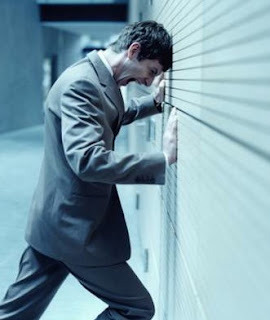 "Once again, Canada’s antiquated first-past-the-post system wasted millions of votes, distorted results, severely punished large blocks of voters, exaggerated regional differences, created an unrepresentative Parliament and contributed to a record low voter turnout. - Green Party: 940,000 voters supporting the Green Party sent no one to Parliament, setting a new record for the most votes cast for any party that gained no parliamentary representation. By comparison, 813,000 Conservative voters in Alberta alone were able to elect 27 MPs. - Prairie Liberals and New Democrats: In the prairie provinces, Conservatives received roughly twice the vote of the Liberals and NDP, but took seven times as many seats. - Urban Conservatives: Similar to the last election, a quarter-million Conservative voters in Toronto elected no one and neither did Conservative voters in Montreal. - New Democrats: The NDP attracted 1.1 million more votes than the Bloc, but the voting system gave the Bloc 50 seats, the NDP 37. Greens - 7% of the popular vote: 23 seats (not 0) "
I'm not sure how we ensure that politics is seen as relevant to our daily lives but letting everyone's vote count couldn't hurt. Although I'm not running in this election I thought I'd post a little reminder that it is in fact Election Day in Canada and everyone should be planning to get out and vote. Remember you only have until 7:30pm here in Alberta. If you need to find out where to vote you can check with Elections Canada All you have to do is type in your postal code in the center of the page to find out where your local polling station is. If you don't think you know enough about the parties and what they stand for you can go here to read up a little. There are lots of neat things going on out across the country in this election... things like this for example. On the other hand it's kind of a shame that people feel they need to resort to this because the federal electoral system is set up the way it is. All I know is that after the Arctic Winter Games executive committee meeting wraps up tonight I be on the couch watching the results roll in! This morning a city transit bus, wrapped to promote the up coming 2010 Arctic Winter Games was unveiled. Representatives of Ernie's Sports, Bus Bench Promotions and SOS Graphics pose for the media. AWG President Debbie Reid poses on the left side of the bus which features AWG sports such as table tennis, snowshoeing, the one foot high kick and some of the cultural delegations. The right side of the bus also features a cultural performer at the front and working back from there; gymnastics, wrestling and figure skating. I think the bus will be a great way to promote the games and raise awareness that they are coming up quickly! It's going to get put in to service soon and from the 22nd to the 25th of this month is will be our tour vehicle as we host the first Chef de Mission tour. The representatives from all the participating countries and jurisdictions will be in the city to check out how preparations are going and what our facilities are like. I think we'll wow them! October is Canadian Library Month - "Your Library, Your World"
Daily Herald Tribune Archives Online! Check out our new online resource Sun Media Corporation Library Archives. You will find complete editions of the Grande Prairie Daily Herald-Tribune that are archived back to November 1, 1999. This resource is only available within the Library. From our website at www.gppl.ab.ca, click on Online Research Tools under Resources for a list of all of the electronic tools offered by the Library. The Library will not be accepting donations of used books and other materials until the move to the Montrose Cultural Centre is completed in the spring of 2009. Thank you for your understanding! Last week I was in Edmonton for the annual AUMA conference. I went down a day early so I could be there at 9am for a full day pre-convention workshop on "Green Building". During the session I was taking notes and then during the break I typed up a little synopsis on my blackberry that I emailed in to Blogger (the system that runs this website) so that it would come up as a new post for your to check out. I did the same thing the next couple of days as I attended education session and the rest of the conference. During a little downtime in the hotel room I thought I'd just check in on the site to make sure that the posts looked ok as the formatting doesn't always translate well from the blackberry to the website. Imagine my surprise when none of the posts I had emailed in where up on the site! Not a single one had made it up there - I don't know if the problem was with blogger or with my email or with the blackberry. Luckily I still have my notes, so over the next few days I'll take some time an put together a post to cover the conference. There was a lot of good information and I'd really like to pass it on. In the mean time, you can check out this overview from Peace River Councillor Leslie Ayre-Jaschke. Leslie and I have emailed back and forth a few times since she's started her blog but this AUMA conference was only the second time we've met in person (the other time was when she represented PR council in GP for the 50th Anniversary Home Coming Weekend).